The aim of the study is to analyse how the social capital in Poland affects contracting. It’s role is significant as the contracts concluded on the market are incomplete, i.e. they do not regulate all the issues explicitly. 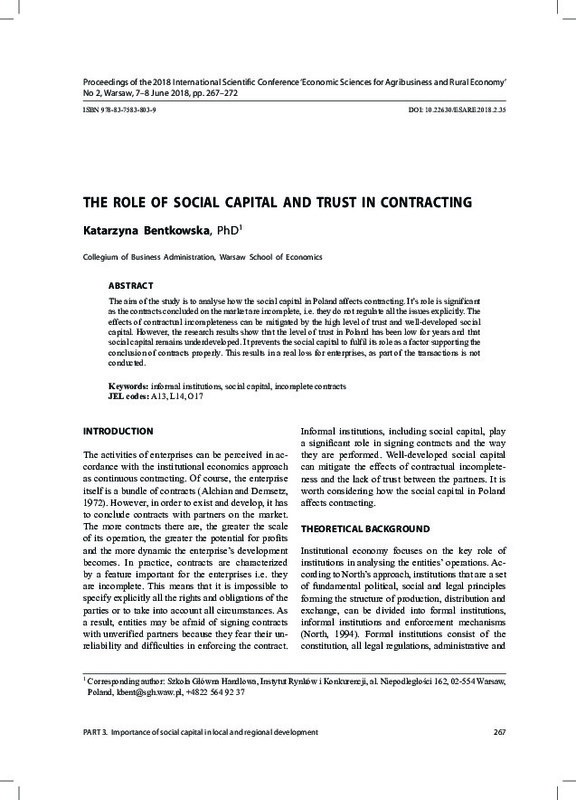 The effects of contractual incompleteness can be mitigated by the high level of trust and well-developed social capital. However, the research results show that the level of trust in Poland has been low for years and that social capital remains underdeveloped. It prevents the social capital to fulfil its role as a factor supporting the conclusion of contracts properly. This results in a real loss for enterprises, as part of the transactions is not conducted.